Unless someone is an automobile enthusiast the garage in residential construction doesn’t get the attention it deserves. By today’s automobile standards the car barn is too small; the inside space, the doors as well as the area required to access it are just a few of the considerations that are often overlooked or under-considered by the common builder, and I believe most often done in an effort to cut costs. We also stretch and pull our homes in so many directions further infringing on auto space without any compensation or adjustments. We as consumers should be asking the question, why does the garage suffer so much and what can be done about it? For one thing, our cars are so wide today that an eight foot garage door is barely enough to squeeze the average car through it. Even some moderately sized and compact cars have trouble making the fit without losing a mirror once in a while. A nine foot wide door should perhaps be the industry standard. Not only will this give us the space we need to get in and out of the house, but will in turn provide the needed space to circulate properly around the vehicle. We will also be able to get in and out of one car without bumping doors into the adjacent auto while inside this space. We get into more trouble with rear and side-load carriage sheds because the driveway isn’t wide enough to properly make the turn. As a result, we end up making three-point turns to go inside, or worse scrape the garage door track because we turn prior to clearing the opening. Both the car and garage are now in need of repair. This situation is compounded by the aforementioned skinny garage door. Even a full double wide sixteen foot door doesn’t provide the space we need if another vehicle is already parked. If you have a truck or SUV the standard seven foot tall door height may give you fits too. Add a cargo or recreational roof rack to that and forget accessing your car refuge. Fortunately doors come in eight and nine foot heights, but good luck finding one of these in any builder’s list of standard features. You will most assuredly pay extra for this bonus, but it may well be worth the cost. I can tell you many architects and designers don’t like garages at all. They feel it either detracts from the home or simply does not belong where people live, and if we must have one it should be separated from the home completely. Nevertheless, architect or builder, if you are going to provide a garage then properly plan for it; don’t take the short cut because we need to save on the budget. If it is not in the budget take it off the wish list and make more modest improvements in other areas of the home. It can always be added later. The cost of these larger spaces as well as the engineering required to structurally support the seemingly excessive span of these rooms seems unnecessary, especially when we consider that it’s not even living space. As a result, we continue to cut back on the dimensions until it is impractical to park a car inside, much less get out of the vehicle once we’ve stopped. 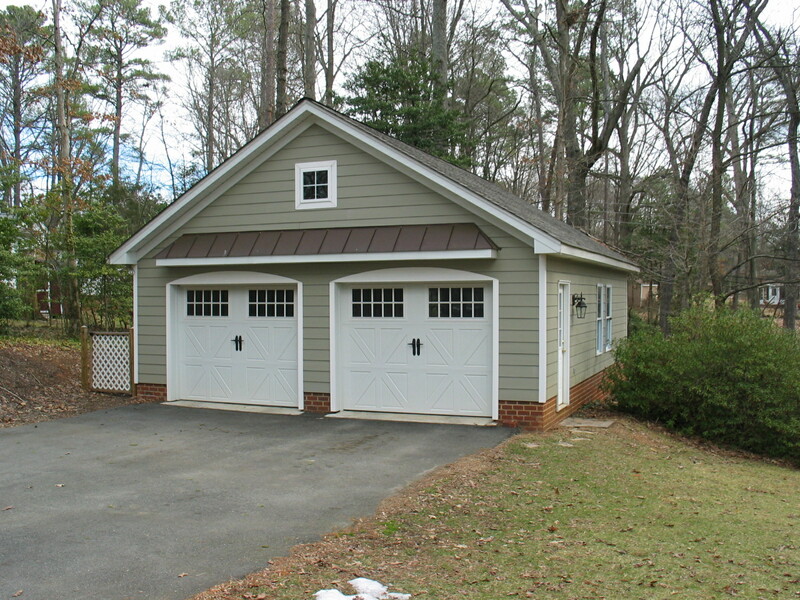 If the client or perhaps the neighborhood standard dictates a garage we should insist it be large enough to accommodate the intended purpose. Plan on a suitable depth and width to house the largest of automobiles and you will err on the side of greater satisfaction to the end user. 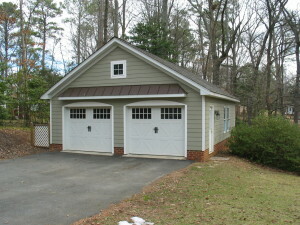 A properly designed garage will also add value upon resale of the property. Allow a minimum of two feet around the sides of each vehicle. This space should not overlap the bay of the adjacent vehicle. The width of each bay should be approximately twelve feet. Allow a minimum of two feet behind the vehicle, just in case access around the rear of the car is needed while the garage door is shut. Allow a minimum of two-and-a-half feet in the front of the car for all the obvious reasons. Do not allow storage areas, bins, shelving or work benches to encroach into these minimums; your satisfaction will be elevated and frustration eliminated. Increase the width of the garage door to nine feet, and consider a height of eight feet. If you are a die-hard owner of compact cars you can disregard this advice, but keep the notion of resale to an SUV owner in the back of your mind. Every situation is different and should always be evaluated by a professional prior to implementing a plan. These suggestions are generated from feedback we have received from clients in both real estate and in the practice of architecture. Please contact us if we may be of assistance to you or your garage.